The US is preparing tariffs on all remaining Chinese imports to the US and could announce the move as soon as December, according to a new Bloomberg report. The tariffs could be announced in the event that talks between US President Donald Trump and Chinese President Xi Jinping at the G20 summit in late November do not help ease the US-China trade war. The tariffs would apply to roughly $US257 billion worth of Chinese goods and likely increase prices for US businesses and consumers. The Trump administration is preparing to take the trade war with China to a fever pitch if talks between President Donald Trump and Chinese President Xi Jinping fail to deescalate the fight, according to a new report. Bloomberg reported Monday the Trump administration is readying tariffs on all remaining Chinese goods coming into the US and could announce the move as soon as early December. The announcement could cover an additional $US257 billion worth of Chinese imports to the US, adding onto the $US250 billion worth of goods already subject to additional duties. Trump and Xi could still avoid the escalation of trade war, Bloomberg said, if talks at the G20 meeting in Argentina at the end of November are productive. If those talks fail, the final round of tariffs could go into effect in February – just in time for the Chinese Lunar New Year celebration. When asked about the report during the press briefing Monday afternoon, White House Press Secretary Sarah Sanders declined to elaborate and only said that she hoped the meeting between Trump and Xi goes well. The final list of goods would largely hit consumer products and capital goods, which the Trump administration has so far spared, and likely would push up prices for many US businesses and consumers. Economists and US companies have warned that the increased costs from the tariffs could hurt the American economy. The trade war between the US and China kicked off in March when the Trump administration announced tariffs on $US50 billion worth of Chinese goods, the goal of the tariffs was to punish China for the theft of US intellectual property and noncompetitive economic policies that the US said harmed American firms. In response, the Chinese announced tariffs of its own on $US50 billion worth of US goods. Despite discussions, the first wave of tariffs went into effect in July and soon after Trump announced a second wave of tariffs on an additional $US200 billion worth of Chinese goods. That set was imposed in late September, while the Chinese replied with tariffs on another $US60 billion worth of American goods. 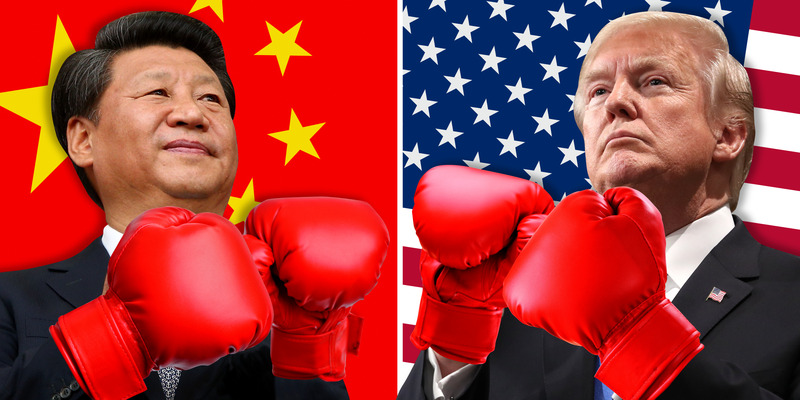 Formal talks to deescalate the trade war between the two countries have been few and far between, with both sides trading nontrade blows as well. For example, Trump pulled the US out of a 144-year-old international postal treaty that made it cheaper for Chinese companies to ship goods to the US. Following the Bloomberg report, US stock indexes slipped into the red for the first time on Monday. The Dow Jones industrial average was down 400 points, or 1.6%, as of 3:37 p.m. ET, which was nearly 700 points from its high-water mark for the day. Similarly, the tech-heavy Nasdaq was down 188 points, or just over 2.6%, and the S&P 500 was down 28 points, or 1.1%. March 1: Trump announces tariffs on all imports of steel and aluminium, including metals from China. September 18: China says it has “no choice” but to retaliate to the fresh tariffs “to safeguard its legitimate rights and interests.” It announces tariffs on $US60 billion worth of US goods sent to China. September 22:China cancels planned talks between mid-level Chinese officials and Treasury Department representatives. September 24: The second round of tariffs goes into effect.